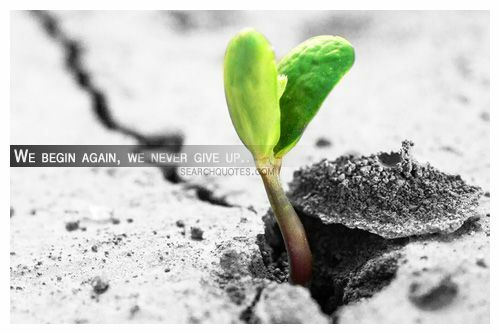 We begin again, we never give up. 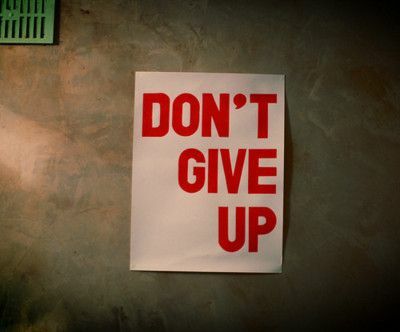 Realizing that there are huge differences between giving up and moving on is a huge part of becoming mature in life. A person with a considerable amount of wisdom is a person that knows when it is time to let something or someone go out of their lives. Not every one knows every single answer to every problem, and yes sometimes people make mistakes by leaving a situation to early, or staying in a bad situation for too long, but those who just seem to know the right time for a need in the change of scenery, are those who are willing to listen to their heart. It is important to think about our decisions in life and to weigh them against our past experiences and so forth, but there are times when we just have to be willing to listen to what is being said in the deepest part of our heart. We don't or at least we aren't supposed to be living our lives in hopes of making everyone else happy by our accomplishments. Though we are supposed to live our lives helping others and making this world a better place, we must do so as ourselves. Those who are willing to give up are usually going to be those of the majority, while those who are willing to stand-alone are usually those who are more handsomely rewarded. This life is full of many roads, many different opportunities, and many different limitations, because frankly we are all different in a multitude of ways. 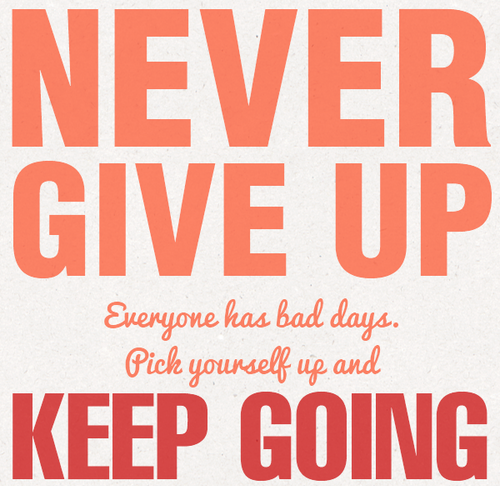 Never give up everyone has bad days. Pick yourself up and keep going. Picking yourself up and carrying on is a very difficult task to accomplish, but it is a necessary one if we ever want to reach our potential. 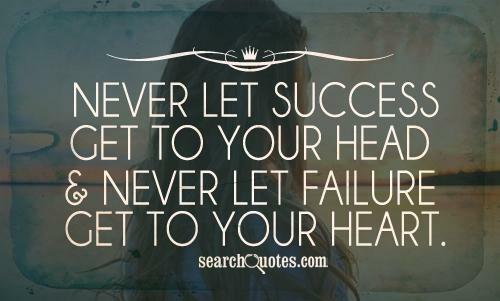 Life is full of its ups and its downs, and if you allow it to beat you down enough to the point of where you feel defeated enough to not get back up, it most certainly will. 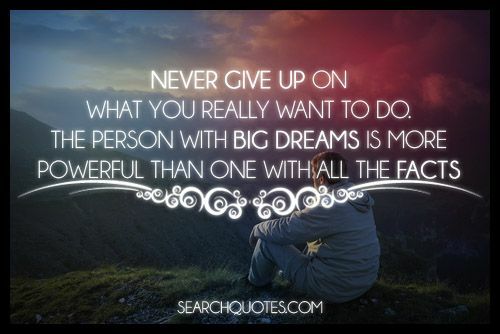 Giving up will never allow you to achieve your dream. As long as you are alive the potential to reach your dream is still out there, don't let your difficulties discourage you, use the negative energy to fuel your positive gain!